09.10 Visit Cai Vieng pier, transfer to boat to visit Mangrove Forest , fish farm and Thien Long cave ( Thien Long means Dragon of Heaven – the biggest cave on the island was newly found in 1998), here you can see beautiful stalactites and stalagmites in the cave and visit some graves of ancient Viet people who died thousands year ago. Thien Long cave is a beautiful limestone cave, which locates within mountain range of Phu Long commune of Cat Ba Island. To access the site, from Cat Ba town we take a van following the trans-isnald road to Phu Long Harbour where connect the Island with Hai Phong by speed boat. From the harbour, we take a boat along Phu Long river, through a large mangrove forest to this cave to hear our local guide spoke about the legend and mysteries. This wonderful boating and caving trip takes us about 3 hours to complete and was organized by Ecolife Cafe Phu Long, a local community ecotourism development program assisted by Center for Marinelife Conservation and Development. 12:00 Come back to Ecolife cafe for seafood lunch before transferring to Catba town. Thien Long Cave, located on Cat Ba Island just off the coast from Hai Phong City in northern Vietnam, is an attractive site thanks to its magical beauty and the curious legends surrounding it. The cave is said to be as beautiful as a fairy lair, holds prehistoric relics and may have even been the hideout of pirates. An interesting eco-tour from Hai Phong City starts with Thien Long Cave to peak the interest of visitors, and includes discovering the surrounding wetlands and mangrove forest. The area is accessible via hydrofoil from Hai Phong Pier or Cai Vieng Quay, or cars can make the trip by ferry. Boats can be rented to take you through the canals in the mangroves. Later, a 10 minute walk will bring you to the entrance of Thien Long Cave. The beauty of Thien Long Cave surprises many first time visitors. The entrance is a jumble of eye-catching formations in different shapes and postures. Getting deeper into the cave, there are many more features awaiting your discovery. Rows of stalactites show an untouched beauty, creating an amazing natural scene. There are three separate inner chambers, all have million year old stalactites stretching down at their glacial pace, growing with each drop of cool water. The first cave holds a giant stone pillar. The second has a massive arch on which stalactites hang down softly and serve as a stone musical instrument, creating warm natural sounds which echo all over the cave. Many animal-shaped stones are visible, posturing in a friendly way as if greeting viewers. The third cave can be reached after climbing over a large stone shaped like a tortoise. “Heaven Cave” is on the left and “Buddha Cave” is on the right. Glistening stone formations resemble statues of fairies, gods and sacred animals. You will feel like you are in heaven when wandering through this amazing stone palace of fascinating shapes, sounds and colours. The local guides tell stories of the cave’s history and point out the relics of prehistoric people who settled down here. Pirates were also said to hide and live in this cave in the past. It should take around two hours to see the entirety of Thien Long Cave, getting your fill of primitive beauty and legends about the cave’s history. Your tour may continue at the nearby Cat Ba National Park, where you can climb Ngu Lam Peak and learn about the precious wood that the kings used to make chopsticks. 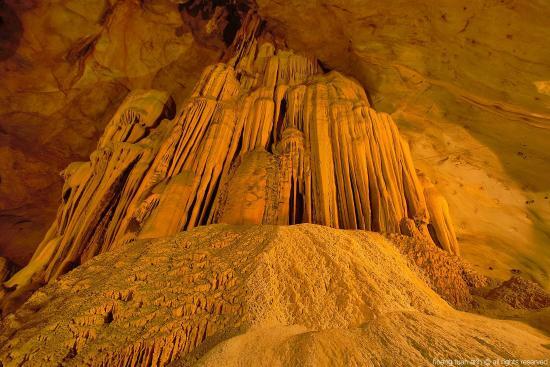 Don’t rush away though, take the chance to sit back and enjoy the scenes of Thien Long Cave. Viet Hai Village, located approximately 18 km from Cat Ba island, the small fishing village of Viet Hai stretches along the coastline. To reach the village one can embark on an 8km trek passing the Ao Ech Lake before arriving in Viet Hai. Home to Cat Ba National Park is the largest island in Halong Bay covering an area of more than 350 square kilometers. Cat Ba Island is actually comprised of 366 islets and islands and is home to a variety of forested zones, coastal mangrove, freshwater swamps, beaches, caves and waterfalls. The island is also home to more than 20,000 residents who main source of income is fishing and farming, although tourism is becoming an increasingly profitable way to make a living and many hotels and restaurants have sprung up on the island in recent years. Established in 1986, Cat Ba National Park encompasses an area of 15,000 ha - over 50% of the island. The terrain is mainly composed of limestone mountains, many with stunning caves and grottoes. The highest peak is Cao Vong measuring 322 m. The park boasts over 120 animal species including over 69 species of bird, 20 reptiles and 32 mammals. Other fauna include the python and numerous animals on the endangered list, among them the red-faced monkey and the leopard cat. In addition the park is also home to a botanical garden with more than 150 families of plants.